Some?days are getting cool enough that the dogs are eager to come inside and curl up on beds instead of hanging out on the front porch. 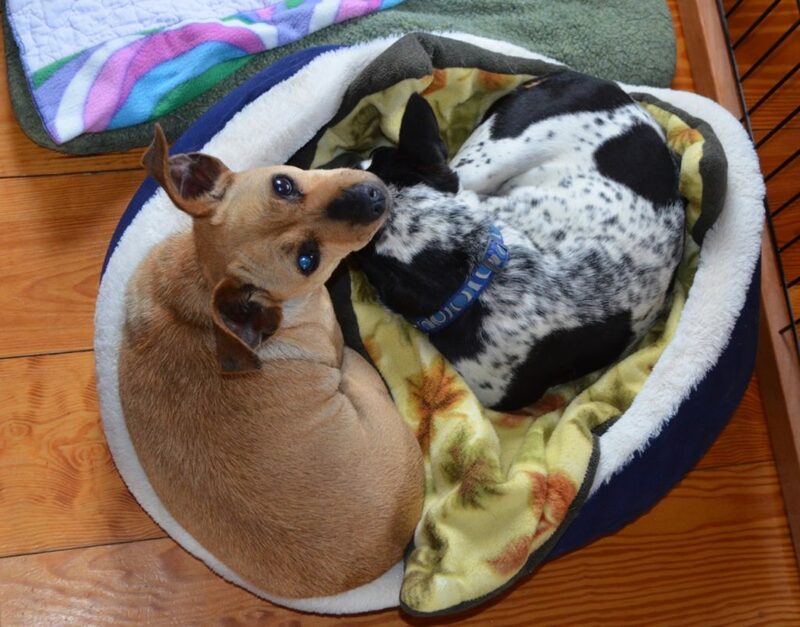 Alayne got this shot yesterday morning of Sunny on the left with blind Taco, curled up’together in a?round foam bed in the puppy pen in the living room. As you can see, there was another large bed in the pen, unoccupied — but better to use each other for warmth than have extra space to stretch out in, right? They’ll soon be lounging outside again, though — we are forecast to be in the 70’s and sunny for a few days, starting tomorrow, so it may be the last gasp of summer for us. We will all — dogs and humans — enjoy it while we can! Aww, that’s so cute. They look so cozy. 🙂 Yes, enjoy the warm weather while you can. I’m looking forward to a photo of your pretty leaves later this month. Your stories always make my day happy. Awww, such a sweet sight! I want to snuggle right in there with them.